This is a QuickTime Virtual Reality movie. To view it you must have the QuickTime plug-in on your computer. You can download QuickTime free for your Macintosh or Windows computer by going to the Apple Computer, Inc. website. If you have never viewed a QTVR, hold your mouse on the movie, click and hold your mouse button while dragging your mouse right, left, up or down. Amazonian mythology is as vast and varying as the Amazon River itself. 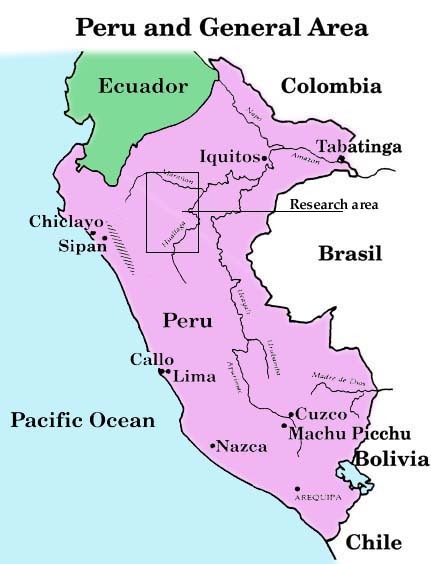 The Amazon River basin covers several countries and each country has its own stories and myths. Each country has its own way of telling these stories and myths. When these stories are told from one person to the next, each person tells his or her own version, creating stories that never stay the same. Since most of these tales are spread orally and are not written down, they can change very fast, yet they always keep their main magical spirit. To give you some idea of these myths I will cite just a few stories that are common in the Peruvian rainforest and ones that I heard as a child living in a village along the river. The river people believe that pink dolphins (the botos) use to be humans many, many years ago, and that they can turn back into humans whenever they want. When they turn back into humans, they kidnap young boys and girls and take them to live with them in their underwater villages and cities. It is also believed that dolphins can use water creatures as objects for their daily lives besides using them for food. The walking catfish become their shoes, the anacondas are their hammocks, the sting rays are their hats, and the water snakes are their belts. When a person is taken into the dolphins' world of the dark Amazon waters, he or she is immediately transformed into a dolphin. If this happens, this person will never come back to be a human again. This might be a way for the people in the Amazon to explain when someone drowns in the river or becomes lost in the forest. Dolphins are at the top of the food chain in the Amazon River basin along with the jaguars, harpy eagles, anacondas, and caimans. All of these animals -- except dolphins -- are hunted for food or for their skins. Even though there are laws protecting all these animals, dolphins probably aren't hunted because the myths and superstitions help protect them. People don't kill dolphins because they think it's very bad luck to kill them. They don't eat them because they believe dolphins use to be people. Now I will tell you something about anacondas. An anaconda is a huge snake, the biggest in the world in terms of length. They can be as long as 40 feet. They live in the rivers and feed on fish, other reptiles, birds and mammals. Anacondas are rather slow and shy, but they can capture and feed on animals that are of a large size compared to the anaconda's body weight. According to the people in the rainforest, anacondas can grow as big as the size of the giant trees of the forest; at least 120 feet long and three to four feet in diameter. Many people believe these giant snakes live in the large lakes and move very little -- only just to feed. These super giants are the guardians of the lakes and the wildlife that live here. The locals have a great respect for these giants and fear them. Nobody wants to go hunting or fishing in the lakes where anacondas are believed to live, therefore the plants and animals are protected. If any brave soul trespasses into the anaconda's territory then the earth will start to shake, the climate will suddenly change and rain, wind and lightning will occur -- threatening the trespasser's life. All of this makes me think that the legends and the superstitions are really very good protection for the rainforest and some of the animals that live here. I only wish that there were similar myths about the other endangered species here like the giant otters, harpy eagles, river manatees, macaws and toucans.